Obesity is considered a widespread health problem in the United States – during 2009-2010, 35.7 percent of American adults were obese. In North Carolina, an estimated two-thirds of adults were reported overweight or obese, and the prevalence of childhood obesity in North Carolina is fifth in the nation. The U.S. Centers for Disease Control and Prevention use height and weight to define obesity through body mass index (BMI) – adults with a BMI greater than 30 are considered obese. You can find more information about BMI, including a BMI calculator, on the CDC website. Health risks associated with obesity are numerous, but include heart disease (the nation’s leading cause of death) and type 2 diabetes (North Carolina’s and the Mountain Resource Commission [MRC] region’s seventh leading cause of death). For more information on disease death rates, visit Deaths from Heart Disease, Stroke, Cancer, and Diabetes. 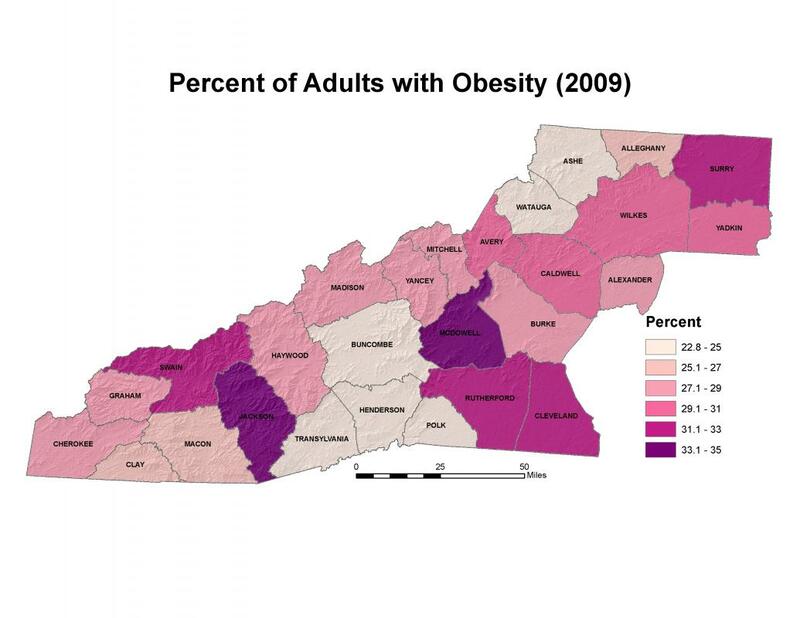 In 2009 in the MRC region, rates of obesity in adults ranged from 22.8 percent to 33.6 percent, with the lowest rates occurring around Buncombe and Watauga Counties, including Ashe (23.3 percent), Buncombe (24 percent), Henderson (24.3 percent), Polk (22.8 percent), Transylvania (24.5 percent), and Watauga (24.9 percent). The highest obesity rates in the MRC region were found in McDowell (33.6 percent), Jackson (33.4 percent), Cleveland (32.5 percent), and Swain (32.5 percent) Counties. While obesity is less prevalent in the MRC region than across the rest of the state or the nation, its rate of incidence among adults has increased from 2005 to 2009 – by 22 percent in the state and by 15.4 percent in the MRC region. The growing rate of obesity is also significant due to its association with a similarly-increasing rate in diabetes incidence, discussed more fully below. For more information on childhood obesity in the MRC region, please see Children’s Health. Diabetes, generally defined, refers to having high levels of blood glucose resulting from complications in insulin production or insulin action. Depending on the type, diabetes can be associated with older age, obesity, physical inactivity, race or ethnicity, and family history, among other factors. Along with kidney failure and blindness, diabetes has been reported as a leading contributor to heart disease, stroke, and depression, and can also lead to non-traumatic amputation.The American Diabetes Association estimates that one of every five health care dollars is spent on treatment for diabetes, and that one of every ten health care dollars is spent for circumstances that can be attributed to diabetes. After adjusting for age and other demographic factors, it is estimated that annual health care expenditures among people with diabetes are 2.3 times higher than those for people without diabetes. Studies have shown that lifestyle modiﬁcations – such as dietary changes, increased physical activity, weight reduction, and anti-stress techniques – supported by a continuing education program can reduce the incidence of diabetes and, among persons with diabetes, the need for treatment of the disease and its complications. 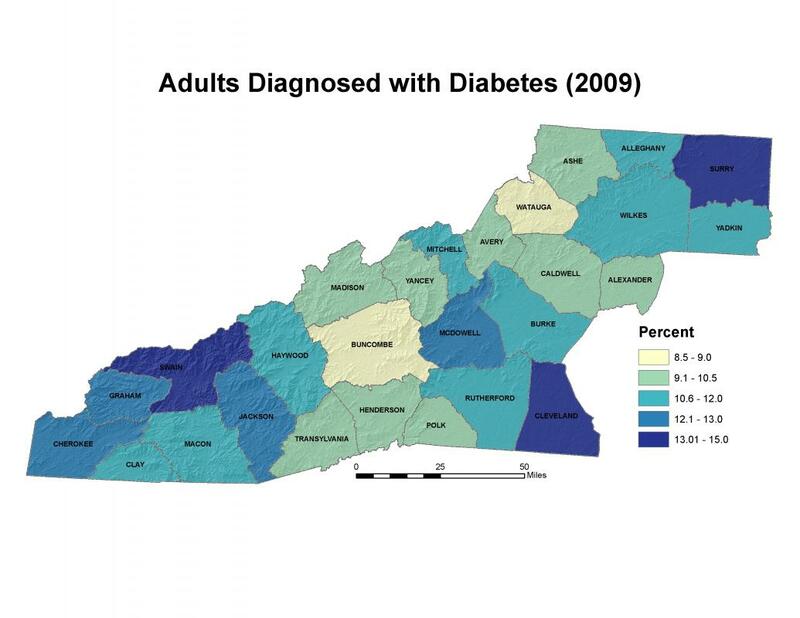 In 2009, the percentage of adults diagnosed with diabetes in the MRC region was 10.4 percent – slightly higher than the 9.8 percent reported for the state – and ranged from a low of 8.5 percent in Watauga County to a high of 14.4 percent in Swain County. 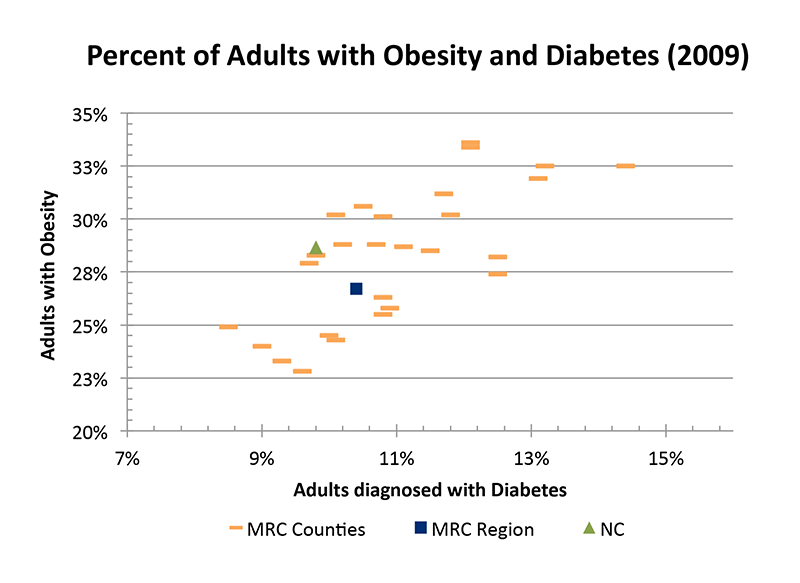 Interestingly, many of the MRC counties with the lowest percentage of adult diabetes diagnoses are also the counties with the lowest rates of obesity, and all have percentages equal to or lower than the state rate: Alexander (9.8 percent), Ashe (9.3 percent), Buncombe (9.0 percent), Polk (9.6 percent), Watauga (8.5 percent), and Yancey (9.7 percent). The MRC counties with the highest rates of adult diabetes diagnoses were Swain (14.4 percent), Cleveland (13.2 percent), and Surry (13.1 percent). Like obesity, the adult diabetes rate has increased in both North Carolina and the MRC region between 2005 and 2009 – a 20 percent increase in the state and a 16.8 percent increase in the MRC region. 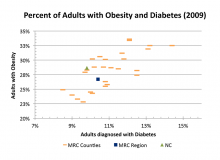 Obesity and diabetes rates per 100,000 people in the MRC region are closely related, with the lowest rates of either being clustered around Buncombe, Henderson, Transylvania, and Polk Counties, as well as Ashe and Watauga. Three counties with the highest incidences of both obesity and diabetes include Surry, Cleveland, and Swain Counties, at 13.1 percent, 13.2 percent, and 14.1 percent, respectively. Physical activity, along with a healthy diet, is recommended for reducing weight and managing some types of diabetes. Although rates of physical activity in adults in the MRC region are higher than those in the rest of the state, there are still many adults who are not physically active, and rates of physical inactivity are related to rates of obesity and diabetes. In Wilkes County, where 30.7 percent of adults are physically inactive, the obesity rate is 30.2 percent. In Buncombe County, where only 19.6 percent of adults are physically inactive, obesity and diabetes are comparatively scarce. More information on having a healthy diet in the MRC region can be found at Access to Healthy Food. Fradkin, Judith, and Rodgers, G.P. 2008. “The economic imperative to conquer diabetes,” Diabetes Care 31(3): 624-625. Konen, Joseph, and Page, Joyce. 2011. “The State of Diabetes in North Carolina,” North Carolina Medical Journal 72(5): 373-378. North Carolina Department of Health and Human Services, Division of Public Health, State Center for Health Statistics. Accessed from: http://www.schs.state.nc.us/SCHS/.